Monoamine precursors (contained in EM-BALANCE) besides being converted to tyrosine, can be converted to phenlyethylamine (PEA). This phenlyethylamine is an endogenous stimulatory or anti-depressive substance. As we age the body produces less PEA. Low urinary PEA levels are found in stressed and depressed individuals. The ingredients in EM-BALANCE are formulated to increase urinary PEA output and central nervous system PEA concentrations. 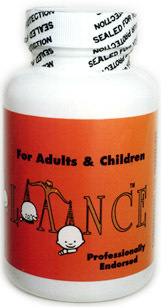 The statements on this web site (www.nutrachem.com) have not been evaluated by the FDA. The products mentioned herein are not intended to diagnose, treat, cure, or prevent any disease. For medical advice, always consult your health care professional.